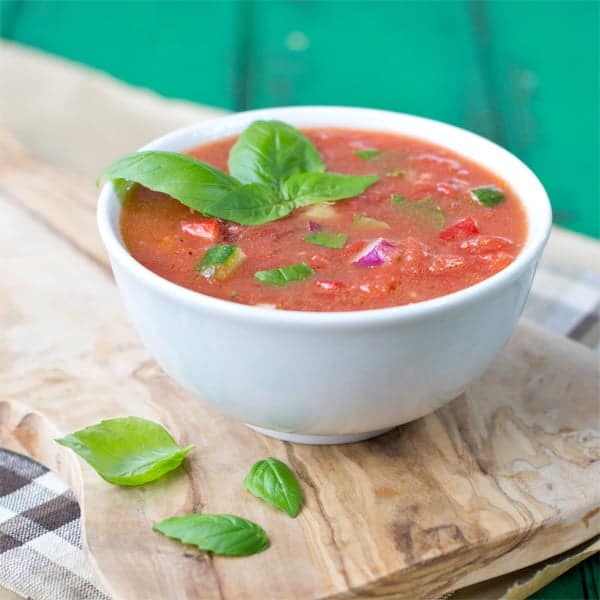 Happy National Gazpacho Aficionado Month! 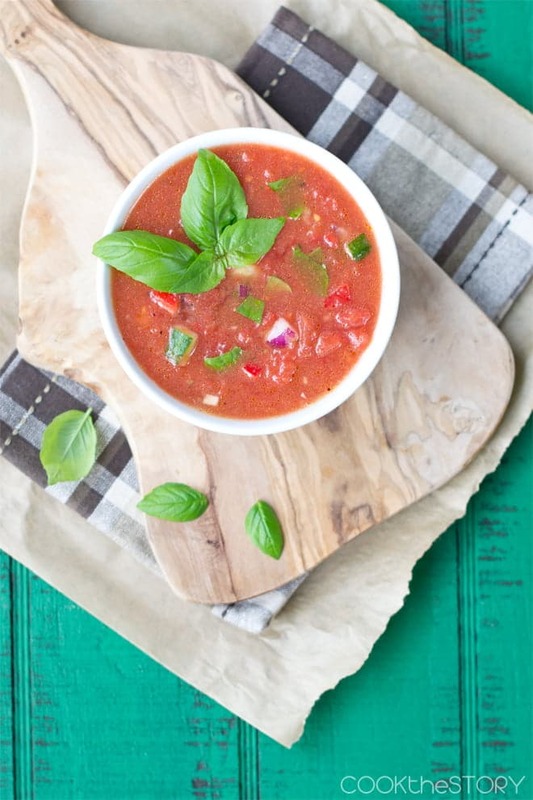 To celebrate I’ve got an easy Gazpacho recipe that’s ready in under 15 minutes. Let’s celebrate! 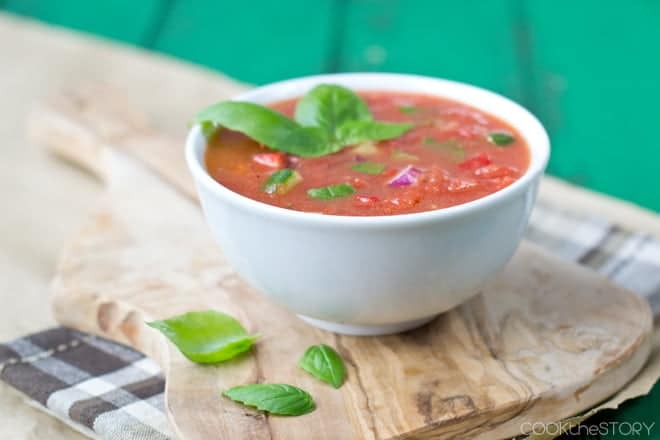 May is National Gazpacho Aficionado Month. Who knew? I did! 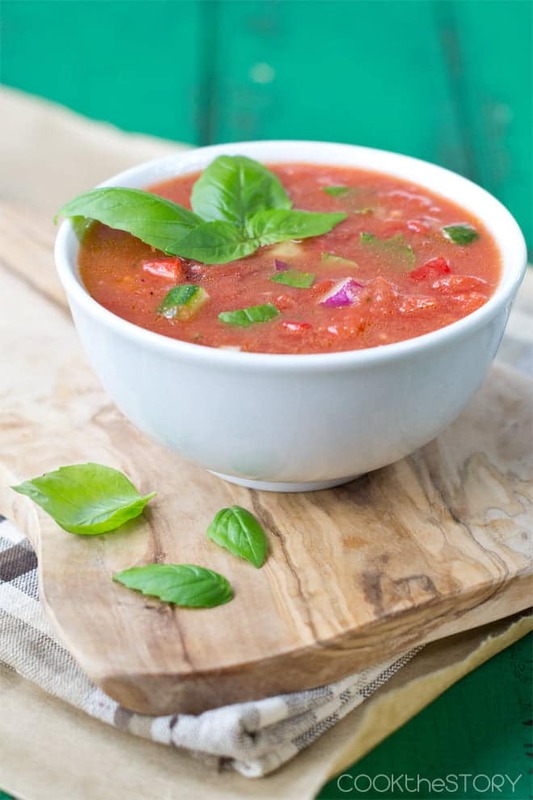 Which is why this week’s SOUPin15 recipe is for an 15-minute easy Gazpacho. Back in the day I wasn’t a huge fan of cold soups, but my graduate school advisor had a real obsession with them. She often took me for lunch to an Italian place that she swore had the best Gazpacho anywhere. There was tons of garlic and chili pepper in there. It was like having a non-alcoholic Bloody Mary, but with more texture and crunch. I fell in love with Gazpacho back then and have been making it ever since. Today’s version is super-easy to make and is unbelievably quick. The trick is to blend ice cubes in with the other ingredients to get it cold in just a few seconds. The SouperTip that makes this soup delicious so quickly is to not water it down too much. The only liquid in the soup comes from canned diced tomatoes and the ice cubes that are used to chill it. There’s no broth or any other water. This keeps all the flavors really strong and clear. Whenever making soups, cold or hot, add flavorful ingredients only; don’t dilute with water unless you taste the soup and decide the flavors are too strong. Why should you avoid water? With a cold soup, you can’t easily take extra water away. With a hot soup, too much water will take awhile to evaporate which takes up lots of your time. Remember that you can always add more water later if the flavors are too strong. But if you add to much at the beginning, it will be hard to bring that flavor back. This refreshing recipe calls for canned diced tomatoes. But in summertime, if you have garden-fresh tomatoes, use those instead. 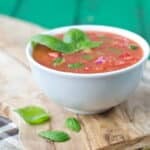 Instead of the 2 large cans of diced tomatoes, use 5 cups of diced fresh tomatoes and two cups of liquid (tomato juice or vegetable/chicken broth). To make this soup in under 15 minutes first read through the recipe. As you read gather together all of the ingredients, tools, pots and pans that you'll need so that everything is within reach. But don't do any prep. All of the prep is included in the recipe and counts towards the 15 minutes. Put a strainer over a medium bowl. Open the cans of tomatoes and dump them into the strainer. To the strained juices add 2 cups of ice cubes. Set aside. Put the strained tomatoes into a separate large bowl. Chop the cucumber, bell pepper and red onion and add them to the diced tomatoes. Seed and mince the jalapeno. Mince the garlic clove. Add them both to the tomatoes along with the olive oil, cumin, Worcestershire, salt and black pepper. Juice the lime and add it as well. Transfer 2 cups of the vegetable mixture to a blender along with the drained juices and any unmelted ice cubes. Puree. Mix the puree in with the vegetables. Add another cup of ice and stir well. Ladle into bowls (avoiding transferring any unmelted iced cubes). Garnish with basil leaves.